Recently, we sewed crib bedding for a friend who was preparing to have her first child. She was looking for a classy design using the neutral colors of taupe and cream. 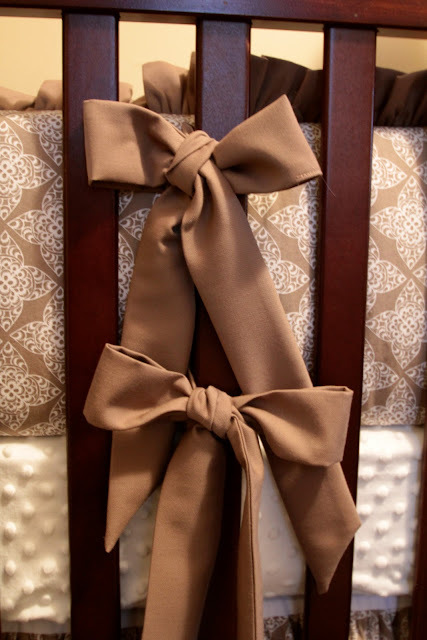 For the design we took a basic crib bumper look, added a solid taupe ruffle around the whole top edge. We then made the ties about 1 1/2" wide so they would tie a classy bow. For the crib sheet and one side of the blanket we used a cream minky material. Minky is super soft so it is very nice for babies. The crib skirt we made a three tiered ruffle all the way around, using the three coordinating materials. As in most designs you never want to stick with just one material, it is always nice to have three materials that coordinate nicely. This creates a pleasing yet balanced look! Great job! I love the colors! So classy.